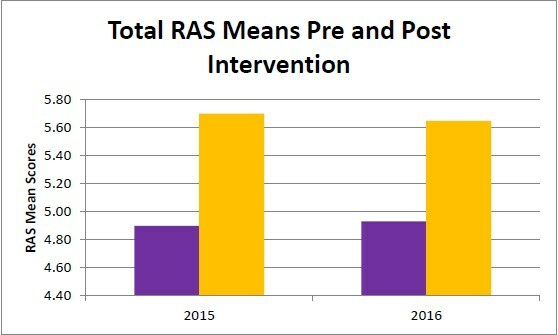 Total Median RAS scores increased from pre measurement (Md = 4.93) to post measurement (Md = 5.65) indicating greater overall recovery. A Wilcoxin Signed Rank Test revealed this increase was statistically significant, z = -.6.37, p < .005, and represented a large effect (d = 0.50). 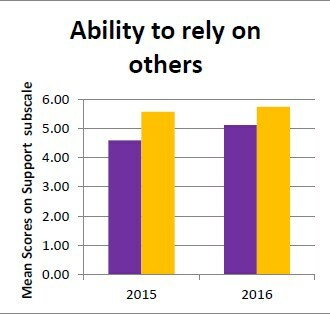 The figures below show pre and post scores on the total and each of the five subscales: ‘Personal Confidence and Hope’, ‘Willingness to ask for Help’, ‘Ability to rely on others’, ‘Not dominated by Symptoms’ and ‘Goal and Success Orientation’. A series of t-tests and Wilcoxin Signed rank tests were run in order to compare pre and post scores, mean and median scores, standard deviations, z values, p values and effect sizes for each of the subscales. All subscales had large effect sizes, as shown in the tables below. 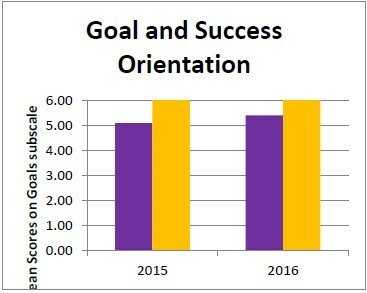 Scores on each of the 5 subscales improved significantly from pre to post measurement (see the graphs below). 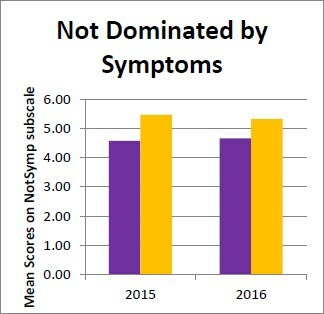 From clinician reflection it was recommended in the 2012 report to examine certain individual items not included in the subscale scores that reflect elements of the programme. These included item 9 “I can identify what triggers the symptoms of my mental illness”, item 13 “There are things I can do that help me deal with unwanted symptoms” and item 41 “It is important to have healthy habits”. 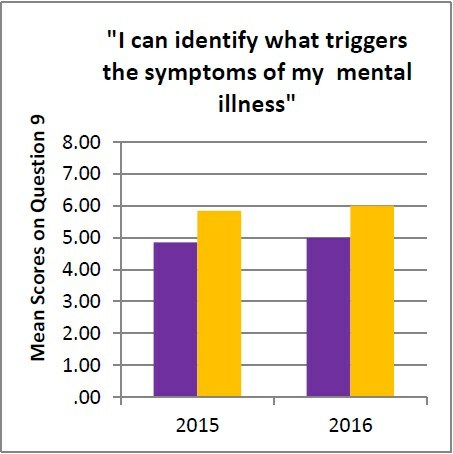 There was a large effect for item 9, “I can identify what triggers the symptoms of my mental illness”, pre to post measurement, r = 0.60.